The mighty Danube River flows 1,788 miles from its springs in Germany's Black Forest to the Black Sea. Just before reaching the sea it forms the second largest and best preserved of Europe's deltas: 2,200 square miles of rivers, canals, marshes, tree-fringed lakes and reed islands. 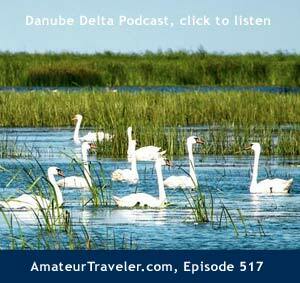 The Danube Delta is a wildlife enthusiast's (especially a bird watcher's) paradise. Some 300 species of birds make Danube's Delta their home, including cormorants, white tailed eagles and glossy ibises. 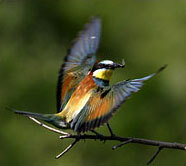 The bird watching season lasts from early spring to late summer. Birds are not the only inhabitants of the Delta. There is also a rich community of fish and animals; from wildcats, foxes and wolves, to even an occasional boar or deer. Altogether, 3,450 animal species can be seen here, as well as 1,700 plant species. » The Danube River is the most international river on the planet - its course runs across — or forms a part of the borders of several countries: Germany, Austria, Slovakia, Hungary, Croatia, Serbia, Romania, Bulgaria, Ukraine, and four capitals: Vienna, Bratislava, Budapest and Belgrade. » The Danube Delta is home to over 60% of the world's population of pygmy cormorants (phalacrocorax pygmeus), 50% of red-breasted geese (branta ruficollis) and the largest number of white pelicans (pelecanus onocrotalus) and Dalmatian pelicans (pelecanus crispus) in Europe. 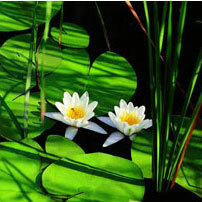 » It also is home to the world's largest reed bed expanse – 625, 000 acres / 240,000 ha. The Danube Delta is comprised of an intricate network of waterways and lakes divided between the three main estuary channels of the Danube. This area of floating reed islands, forests, pastures and sand dunes covers 3,000 square miles and is home to a fascinating mix of cultures and people as well as a vast array of wildlife. Located at the tip of the three channels, Tulcea makes a great starting point for exploring the Danube Delta. The youngest arm of the Danube Delta stretches for some 72 miles along the border with Ukraine and has the greatest flow of water (approximately 60%) of the three arms. Its shores are home to several scattered villages – Patlagean, Ceatalchioi, Pardina, Tatanir – and Chilia Veche, a settlement with a long history (initially a Greek colony called Achillea). Centuries ago, Chilia was a port on the Black Sea, a vital link between Europe and the Orient. In time, the alluvium deposited by the Danube has extended the land ever further into the Black Sea. Today, Chilia stands more than 25 miles from the sea. First documented in 1241 in the works of the Persian chronicler, Rashid al-Din, Chilia Veche was the site of a battle between the armies of Mahomed II, the conqueror of Constantinople, and forces led by Vlad Tepes (Vlad the Impaler). A town on the Ukrainian side of the Danube, known as Novo Kilia (Chilia Noua, or 'Newer Chilia,' in Romanian) was founded by Stephen the Great of Moldavia in the 15th century in order to counteract the Ottoman Empire. Lake Rosca (Lacul Rosca), a strictly protected reserve located between Chilia Veche and Periprava, is home to Europe's largest white pelican colony; the area also harbors geese, egrets and storks. Periprava, downstream from Chilia Veche, is the last site served by passenger boats on the Chilia arm. South of Periprava, you can explore the impressive Letea Reserve (Padurea Letea) with trees more than 500 years old. Oak, black poplar, elm, ash and thorny shrubs are smothered in the tropical creeper named periploca, a Mediterranean plant with reddish-brown bark and simple, glossy leaves, giving the Letea Forest its tropical looks. Here, you may encounter black-bellied foxes, wild horses, boars, falcons and white-tailed eagles. The surrounding sand dunes are home to tortoises and lizards. Note: Access to Letea Forest is permitted only with a guide (warden) on the designated route. You can find accommodations in nearby Letea Village and spend a few days touring the surrounding waterways. Maliuc is one of the Delta's youngest settlements. Lake Furtuna, one of the region's largest lakes, lies just to the north of Maliuc. Pairs of swans and numerous moor hens and wild ducks mingle with other species while white pelicans often gather in huge numbers to feed and roost around this lake. Crisan is the main stepping-off point between Tulcea and Sulina.A fishermen's village with a few houses spreading over the right bank and a fishery on the opposite shore, it makes an excellent base for exploring the surrounding lakes and canals. Private guestrooms and B&Bs are available. From here, you can rent a boat, or lotca, from the locals, and travel on the Old Danube Canal to Mila 23 or to Caraorman (Black Forest in Turkish) village and Caraorman Forest, a strictly protected reserve with brown oak trees, white and black poplars, white willows and fluffy ash surrounded by sandbanks. Owls, white-tailed eagles, falcons, wildcats, boars and wolves, as well as many rare plants, thrive in the area. Note: Access to Caraorman Forest is permitted only with a guide (warden) on the designated route. English engineers measured the course of the Danube in miles, starting with mile 0 in Sulina on the Black Sea coast. Hence, 23 miles inland, you will find Mila 23, a quaint traditional fishing village. Located on a bend of the Sulina arm known as the 'Old Danube' (Dunarea Veche), Mila 23 is one of the main settlements of the Lipoveni, descendants of Russian refugees who fled from religious persecution in the early 18th century and who make their living from fishing, livestock breeding and reed harvesting in this vast area. As this is a good starting point for trips to the nearby waterways, many villagers rent rooms to visitors. Sulina, the terminus point for cruise liners sailing across the Delta, was mentioned for the first time more than 1,000 years ago under the name of Selina in a work written by Byzantine Emperor Constantine Porphyrogenetes. This port town once bustled with traders from Europe and the Middle East, adventurers and sea pirates. The town served as headquarters for the European Danube Commission during the 19th century when the Danube was turned into a waterway suitable for commercial shipping. This huge project attracted workers from all over Europe, and the Anglican, Catholic, Protestant, Orthodox, Muslim and Jewish tombstones in Sulina's cemetery bear witness to this former international community. Sulina is the easternmost point of Romania. Notice the 19th century Greek Church of Saint Nicholas on the waterfront. The 60-foot-tall lighthouse, located in the middle of town, was built in 1802 and restored in 1870 by the Danube Commission. Enjoy a stroll along the 25-mile-long fine-sand beach. A number of interesting villages dot the banks of the Sfantu Ghoerghe arm, which stretches for some 67 miles and carries 23% of the Danube's total water flow. Mahmudia and Dunavatu de Jos were founded either atop or near Greek, Roman and Byzantine vestiges. Legend has it that during Sultan Mahmud's visit to a fishing village in the Danube Delta, he fell in love with a local girl and asked her to marry him. Upon learning that the girl was in love with another man, the sultan commanded the girl to weave him an embroidered shirt that was both fire- and water-proof or he would kill her lover. Sad and hopeless, the girl walked to the riverbank and started to cry. Hearing her sobs, the Danube fairy came out of the water's depths and gave her an embroidered shirt. Before sunset, the girl presented the shirt to Sultan Mahmud, thus, saving herself and her fiancé. Since then, the village of Mahmudia has carried the name of the sultan. Murighiol, a traditional fishing village, is home to the ruined Roman city of Halmyris, one of the most important ancient sites in Romania. The city was continuously inhabited from the 6th century BC to the 7th century AD. Although a basilica and a crypt containing the tomb of Epictet and Astion, the earliest Romanian Christian martyrs, have been discovered here, much of the ruins remain unexcavated. A visit offers the chance to see an ancient city still in the process of being uncovered. First mentioned in 1318, the fishing village of Sfantu Gheorghe is well-known for its traditional cooking, including the famous black caviar (icre negre). A 30-minute walk will take you to one of the longest strips of beach on the Romanian Black Sea coast. Visit historic sites, explore the waterways in a canoe or traditional fisherman boat, catch a sunset you'll never forget, sample wine from vineyards dating back to the Roman Empire and savor some of the finest caviar in the world, the beluga sturgeon from the Black Sea! 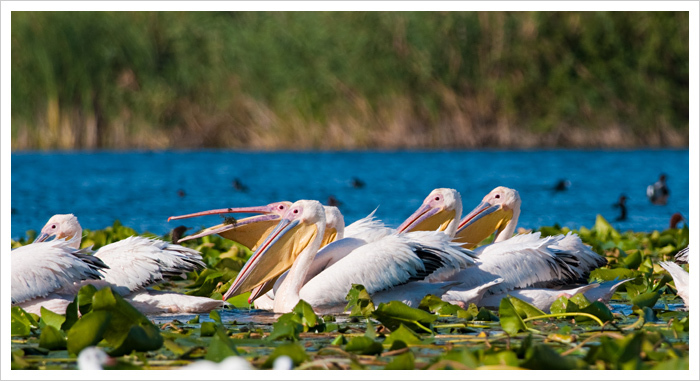 A bird-watchers' paradise, the Danube Delta offers the opportunity to spot more than 300 species of migratory and resident birds, including eagles, egrets, vultures, geese, cranes, ibises, cormorants, swans and pelicans. Located on the 45th parallel, the Danube Delta makes for a perfect stopping-off point between the Equator and the North Pole for millions of migratory birds. In March, swaths of white pelicans leave the Nile Delta and the Red Sea to come nest in the Danube Delta. The Delta is home to Europe's largest breeding population (some 3,500 pairs). After decades of decline, this species' numbers have slowly begun to increase in the Delta. Currently, some 150 pairs have been spotted in several small colonies. The Delta's waters teem with some 160 species of fresh- and salt-water fish. Note: Please check with the Danube Delta Biosphere Reserve Administration (ARBDD) (see information below) for fishing season. 1,678,000 acres including 254,517 acres marine. of which 1,678,000 acres are in Romania and 301,468 acres in the Ukraine. The Razelm-Sinoie lagoon complex adds a further 218,000 acres. - forests on high ground. The prevailing continental climate, with only 18 inches of annual rainfall, is influenced by proximity to the sea and the humidity rising from countless inland lakes and small waterways. This is the largest continuous marshland in Europe which includes the greatest stretch of reedbeds probably in the world. The marsh vegetation is dominated by reeds Phragmites australis which form floating or fixed islands of decaying vegetation ('plaur') with some Typha angustifolia and Scirpus sp. Reeds cover some 420,000 acres and 'plaur' 247,000 whilst the total area not included is only 36,570 acres. There are also water lilies Nymphaea alba, Nuphar luteus and Stratiodes alloides. The higher ground supports stands of Salix, Populus, Alnus and Quercus. Sandy areas are covered with feather grass Stipa sp. and other steppe species. Forest elements are best observed in Letea Forest, occurring in a series of bands along dunes up to 820 feet long and 33 feet wide, where trees reach 115 feet in height. The species present are Quercus robur, Q. pedunculiflora, Populus alba, P.nigra, Fraxinus ornus, F. angustifolia, F. palisae, Pyrus pyraster, Tilia tomentosa, Ulmus sp., and the occasional Alnus glutinosa. Among the shrubs are Crataegus monogyna, Euonimus europea, Cornus mas, C. sanguinea, Rhamnus frangula, R. catharctica, Viburnum opulus, Berberis vulgaris, Hippophae rhamnoides, Tamarix spp. and occasional Corylus avellana. The distinctive feature of the forest is the abundance of climbing plants including Periploca graeca, Clematis vitalba, Vitis sylvestris and Humulus lupulus. In spring, the ground is carpeted with Convallaria majalis. Particularly rare and threatened plants include Convolvulus persica, Ephedra distachya, Merendera sobolifera, Plantago coronopus and Petunia parviflora. The Delta holds huge numbers of Anatidae in the winter with counts of 500,000 white-fronted goose Anser albifrons (but only 64,000-77,500 in 1982), up to 500 lesser white-fronted goose A. erythropus, 45,000 red-breasted goose Branta ruficollis (a globally threatened species with almost 95% of the world wintering population present here), 150,000 teal Anas crecca, 200,000 mallard A. platyrhynchos, 14,000 pintail A. acuta, 40,000 shovelor A. clypeata, 32,400 red-crested pochard Netta rufina, 970,000 pochard A. ferina, 13,000 ferruginous duck A. nyroca, and 1,500 red-breasted merganser Mergus albellus. In winter there is a concentration of some 30-40 Haliaeetus albicilla. The Delta is very important for fish with 45 fresh water species present including threatened representatives of the Acipensenidae. Otter Lutra lutra, stoat Mustela erminea, and European mink Mustela lutreola, as well as wild cat Felis sylvestris are to be found on the floating islands. The mink population, although its size is unknown, is significant in European terms. The forest areas contain several rare reptiles, including Vipera ursini, Elaphe longissiuma, and Eremias arguta deserti. The very long history of trading along the Danube is evident from remains of Greek and Roman settlements (including a lighthouse). Villages surrounding the Delta show a Turkish influence. Estimated at between 12,000 and 16,000, depending on the definition of the area covered and residence status. The population is distributed along the three main waterways, Chilia, Sulina and Sfintu Gheorghe, the main source of drinking water. The local population has been involved in small-scale, low-intensity use of natural resources supplemented by outside interests, such as fishing (10,000 boats are registered), cattle grazing and beekeeping, thought on the whole to be integrated to preservation of natural heritage. The centre of commercial activity in the Delta is the freeport of Sulina. In the late 1980s the town underwent rapid expansion with 500 new dwellings being built, an hotel and a shipping centre to handle 3,500 ships annually. Other urban developments have taken place at Chilia Veche, Sfintu Gheorghe, 1 Mai, Unirea and Independenta. The Delta is the meeting point of Palaearctic and Mediterranean biogeographic zones and represents a unique dynamic wetland ecosystem containing a rich biodiversity of wetland habitats. The site is internationally significant for birds, both breeding and migratory, including a number of globally-threatened species. It is also a vitally important buffer system between the hydrographical basin of the River Danube and the Black Sea. (Excerpts of an article by Ms. Nina Darnton. Ms. Darnton is a New York-based freelance journalist). A VISIT TO THE DANUBE DELTA usually begins in the Romanian town of Tulcea, a two-hour drive from Constanta. As I boarded a small, brightly painted boat and headed for the delta, I entered a world that seemed almost anachronistic. Here, at the gateway to the 2,200-square-mile Danube delta wetlands, I found lakes and channels with crystal-clear water, and a network of islands, covered in swaying reeds, that would be blanketed by wildflowers in summer. The delta is a haven for bird-watchers; willow, ash, and white poplar trees provide nesting sites for more than 300 species of birds over the course of a year. The silence was broken only by chirping and the sound of oars cutting through the water as fishermen rowed by. The Delta Biosphere Reserve has placed strict limits on future exploitation of the region. Scientists have divided the delta into three types of areas: those in which controlled fishing and hunting are permitted; those in which tourism may be carefully developed; and those that are completely off-limits to all but the scientists studying them. IN LATE SPRING AND EARLY SUMMER, the delta, bursting with life, is a breeding ground for hundreds of bird species, including the majestic white-and-pale-pink Dalmatian pelican. Like the pelicans, a number of birds found here nest in colonies, some as many as 5,000 strong. In summer, bird-watchers can see thousands of pelicans and huge flocks of the crimson-backed glossy ibis, with its long, curved beak. During breeding time, when the birds' colors are at their most brilliant, you might catch sight of some other rare species, such as the pygmy cormorant or the red-breasted goose. Or you might hear the call of an egret, and then spot a group of pelicans lifting gracefully into the air in a blur of black-and-white-tipped wings. "You go out on one of these boats," says Gomoiu, the reserve's first governor, describing a trip on the delta. "You leave your line over the back all day to catch your dinner and then you see thousands of pelicans so close you can feel their breath." Visitors need travel permits to enter the Danube Delta Biosphere Reserve. Permits are included with tours; independent travelers can purchase permits from the Danube Delta Biosphere Reserve Administration (ARBDD) and travel agencies and hotels in Tulcea. The current fee is 10 RON (approximately $4) per visit. Separate permits are required for fishing or hunting. Open: Mon. – Fri. 8:00 a.m. – 4:00 p.m.; Closed Sat. & Sun. If you have a tight schedule, it is easier to let a travel agency organize the trip for you (transportation, accommodations, permits). To experience the best of the Delta's flora and fauna, consider a multi-day trip with overnight stays in some of the local villages. Hiring a local fishing boat for a private tour, or taking out a kayak or rowboat will enable you to explore more remote areas. We recommend that independent exploring be undertaken with a guide and not alone. Be sure to pack a strong mosquito repellent when exploring the Danube Delta. Navrom operates both regular and express passenger ferries year-round from Tulcea to towns and villages in the Danube Delta. Ferry tickets are sold at Tulcea's Navrom ferry terminal. Tulcea - Periprava Mon. & Fri. 1:30 p.m.
Tulcea - Sulina Tue. & Sat. 1:30 p.m.
Tulcea – Sf. Gheorghe Mon. & Fri. 1:30 p.m.
Periprava - Tulcea Tue. & Sun. 6:00 a.m.
Sulina - Tulcea Mon. & Fri. 7:00 a.m.
Sf. Gheorghe - Tulcea Tue. & Sun. 7:00 a.m.
Tulcea - Periprava Wed. 1:30 p.m.
Tulcea - Sulina Mon. Wed. Fri. 1:30 p.m.
Tulcea – Sf. Gheorghe Wed. 1:30 p.m.
Periprava - Tulcea Thu. 6:00 a.m.
Sulina - Tulcea Tue. Thurs. & Sun. 7:00 a.m.
Sf. Gheorghe - Tulcea Thurs. 7:00 a.m.
Hydrofoils to Sulina (1 ½ hours) depart from Tulcea every day at 7:00 a.m. and 12:00 p.m., stopping in Maliuc and Crisan en route. Hydrofoils for the return trip from Sulina depart at 8:45 a.m. and 2:00 p.m.
Tulcea Tourist Information Center ( see info below ). 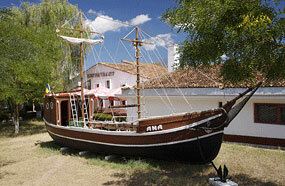 For a list of available accommodations in the Danube Delta please check our Accommodations Guide. Under 'Location' enter the name of the town or village that you would like to visit or simply enter 'Danube Delta' for a listing of available accommodations in the area. To get a full flavor of the local cuisine you can sample some Danube herring, grilled sturgeon fish and zander croquettes, tastily washed down with Aligote, Muscat or Merlot wines at one of the many restaurants in Tulcea. Or you can try the local version of Russian borsht prepared fresh by fishermen in one of the nearby villages. Fisherman's soup – In a big cast-iron kettle, water is brought to a boil with vegetables and some 10 to 15 species of small fish. The liquid is then strained and the small fish discarded. Big chunks of sturgeon, carp or pike are then boiled in the broth. The fish soup makes two dishes: first, the broth is served with a wooden spoon and then the big chunks of fish are sprinkled with chili pepper or garlic. Afterwards, the saramura, prepared from big chunks of carp broiled on the stove or on a spit, is served with polenta and garlic sauce. Sat. 10:00 a.m. – 1:00 p.m.; Closed Sun. The Tourist Information Center provides maps, brochures and information on accommodations and restaurants in Tulcea as well as trips to the Danube Delta. Sat. – Sun. 10:00am – 2:00pm; closed Mon. Sat. & Sun. 8:00 a.m. – 12:00 p.m.; Closed Mon.